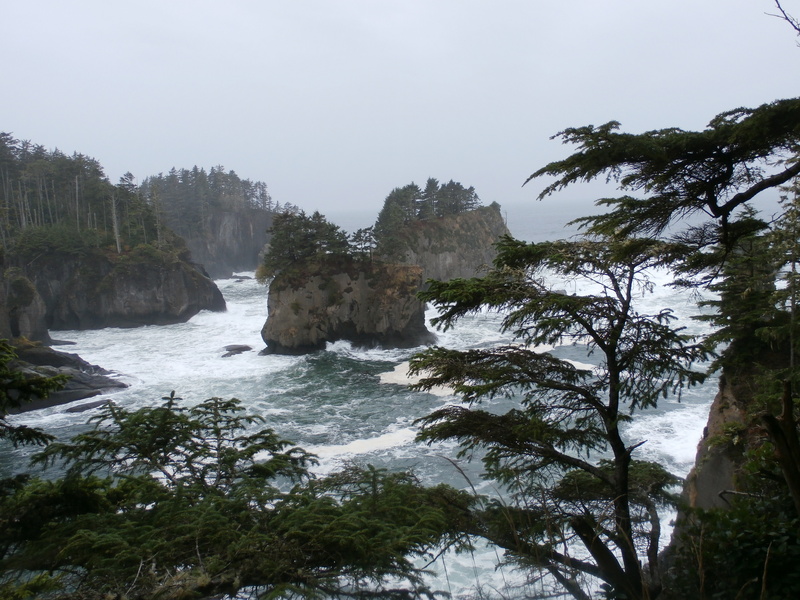 Cape Flattery: a Challenging Hike But Oh So Worth It! There was something intriguing about going to the western-most point in the Continental U.S. After all, I’d been to the southern most point on a trip to Key West. 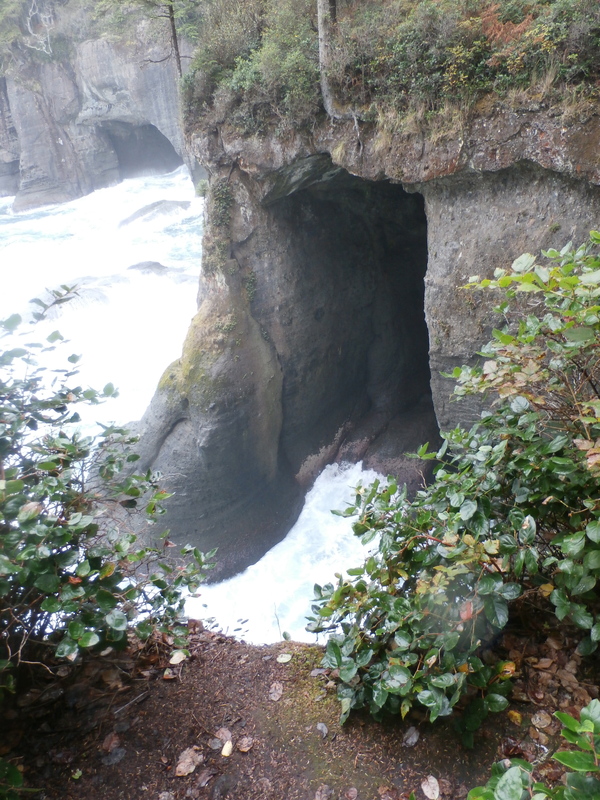 Cape Flattery, WA, however, was far more challenging but it led me to a new realization about myself. As my daughter and I headed west on the two-hour trip from Port Angeles we passed through the remotest land I’d ever seen. We had lived in Vermont and it was positively metropolitan by comparison. Tiny towns dotted our path along with startling views of the Juan de Fuca Straight, separating the Olympic Peninsula from Canada. Huge, ship-like rocks stood off shore as if waiting to berth. 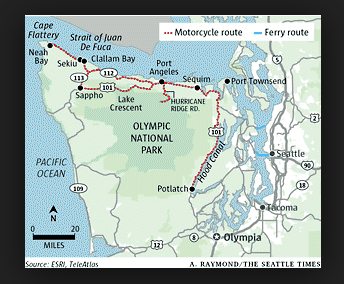 We traveled into the Neah Bay valley that is the Makah Indian Reservation and it was evident these hearty folk had followed their ancients; making their living from the sea. Fifteen minutes later we were at the end of the world. As I stood at the trailhead I could only see a sharp incline under a canopy of trees. Down, down, down, down stairs made of tree roots and foot-worn earth we went. About half way down, soft rain began to fall. Suddenly I could hear the distant surf, out of place in the deep woods that surrounded us. As I stopped to listen, I surveyed the uneven path and began to worry whether my old legs would get me back up. I continued my decent suddenly realizing I was one of those people. You know the ones. They are in all the evening news pharmaceutical commercials. The ones who make you feel inadequate because you are not swimming across lakes or biking along beautiful wooded paths. “Who are these people,” I would ask myself. “They make aging look so fetching.” I knew better. But here I was: A woman of a certain age, having already hiked to Marymere Falls earlier that morning, doing just that type of arduous activity. I just wish I looked like some of the women in the commercials! My mind circled back to that earlier hike near Lake Crescent. 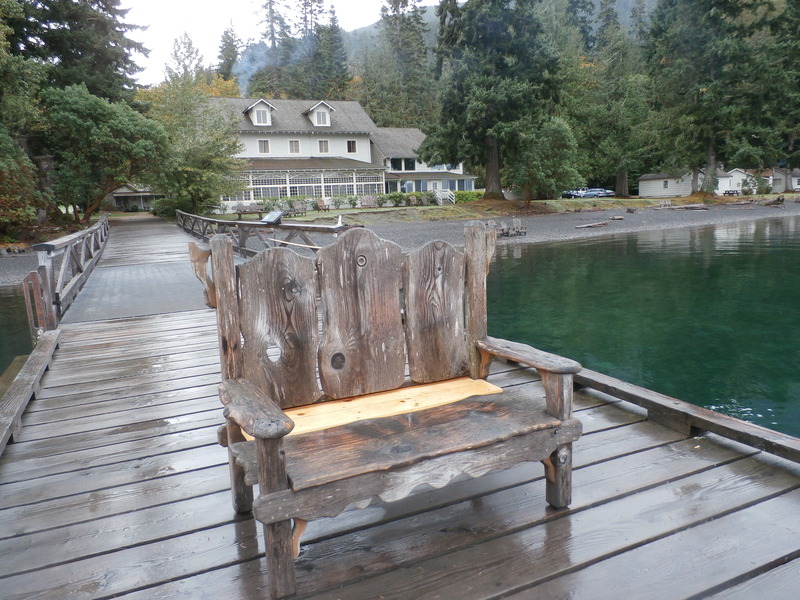 Hard by a bucolic Blue Spruce green glacial lake, Lake Crescent Lodge and cottages looked fetching and bespoke of an earlier time in the National Parks. The October air was cool and wet as soft clouds settled in the far valley and the mountains reflected in the clear-to-the-bottom water. 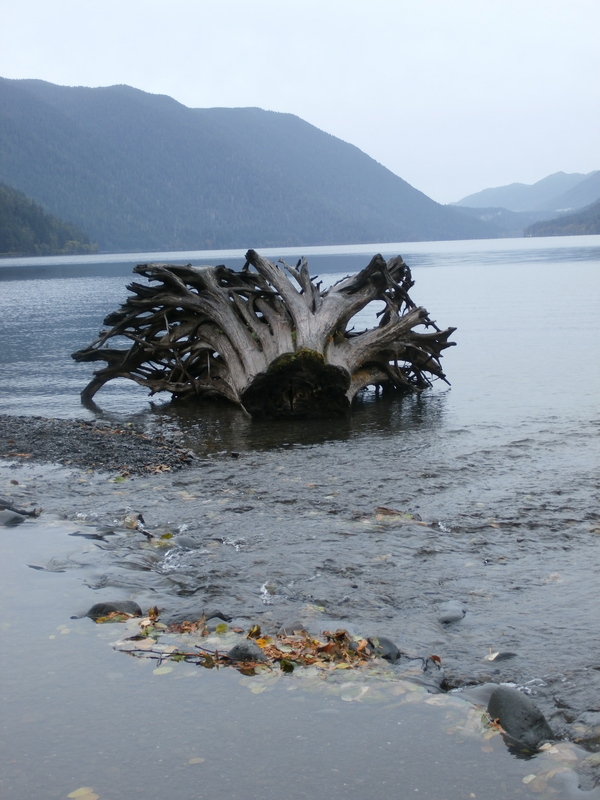 The gentle flow of a brook spilled into the lake to either side of a huge stump lying on its side at the mouth. Yellow leaves swirled in tiny whirlpools. The Marymere Falls hike was to replace my daily two-mile constitutional on the beach at home. The guidebooks called it an easy walk to the falls but did not mention the abrupt climb as we approached the misty cove surrounding the falls. “The woods are lovely, dark and deep,” my mind recalled a long-remembered Robert Frost poem. And they were, deep and light greens contrasting with sunlit dappled yellows, dew-covered ferns, fairy-like leaves and earth tones. Bird song provided the sound track which mingled with the earthy smell of autumn woodland. Now, climbing carefully down, I thought the guidebooks should define the word “moderate” better. It didn’t feel moderate to me. The surf was getting louder and just to our left was a promontory overlooking two sea-torn rocky sentinels, known as sea stacks. The sea swept in crashing at the base, spraying foam up the sides. On top was an unlikely forest of evergreens, cut from the mainland. Was this what it looked like as the continents drifted apart? 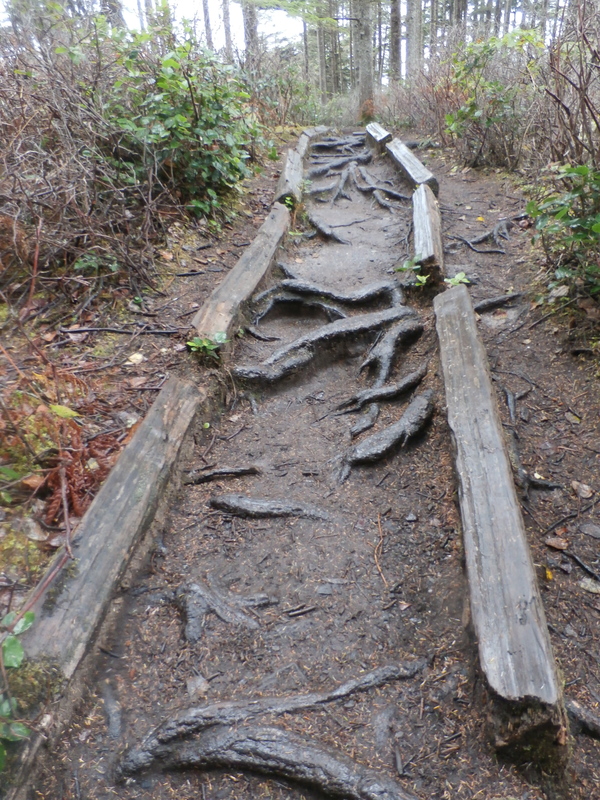 We resumed our hike and were soon slipping along the wet, uneven boardwalk leading to our destination. 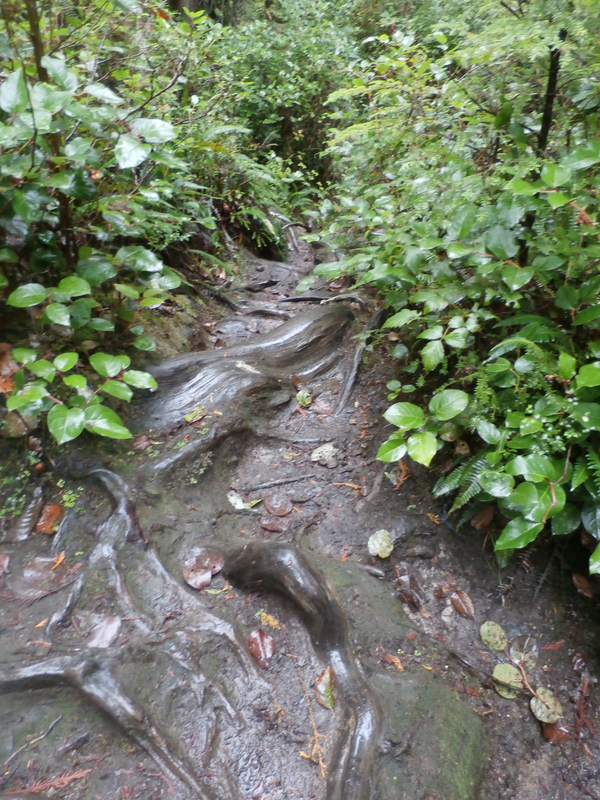 Trail’s end was high atop a rocky cliff overlooking the Pacific. 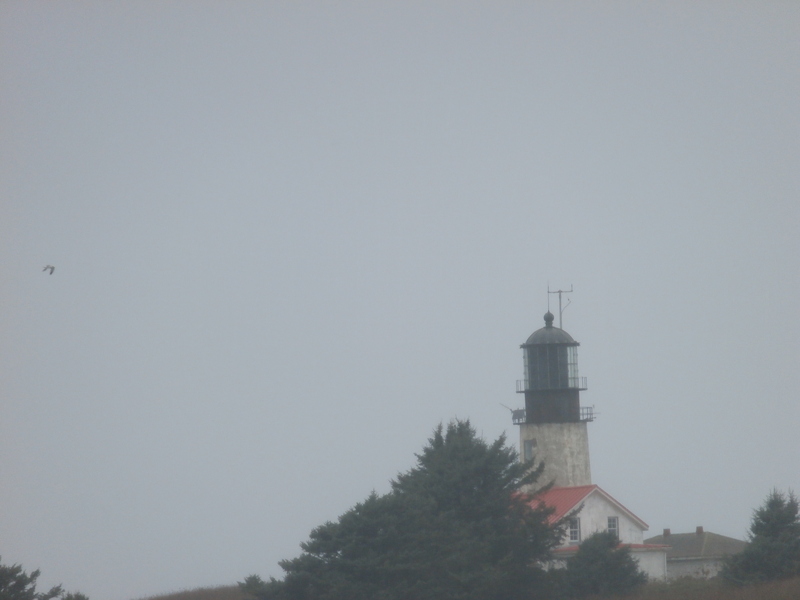 Huge swells flowed through the straight between the cliff and Tatoosh Island, home to Cape Flattery Light House, eerily adrift on the misty horizon. The sea had scoured towering caves in the cliffs on either side of the point. As relentless waves crashed into them, a deep rumbling arose from within like distant thunder, echoing the roiling surf. Too soon it was time to turn and climb. 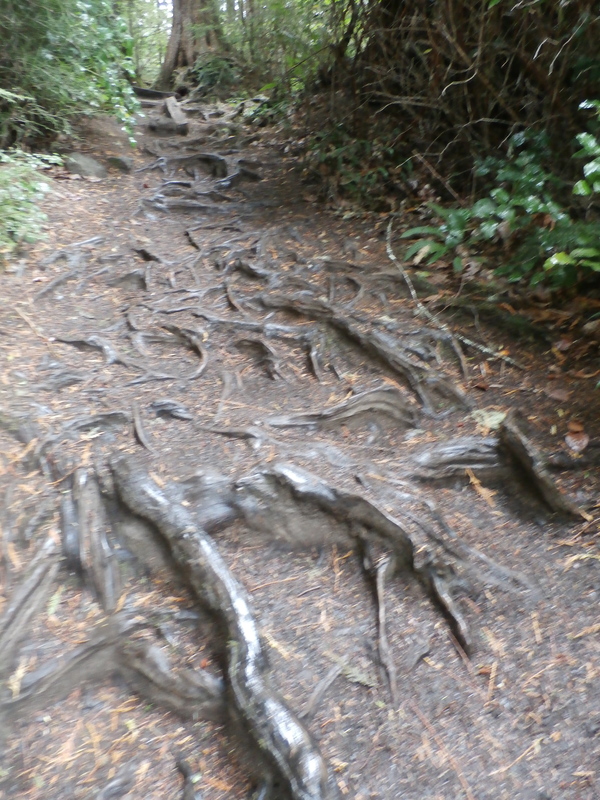 I had my doubts as we picked our way carefully through the exposed roots traversing the path. I kept an even pace and stopped to catch my breath every so often, watching as tiny droplets fell from delicate leaves in the steady rain. It wasn’t long before my climb was at an end. It had taken me 20 minutes to reach the parking lot from high cliff top. As I sat in the car, I felt my breathing ease, my heart rate slow. I was aware of thrumming in my legs and the uncanny energy that follows such exercise. If the guidebooks had actually described the stumbling path and high-degree incline, I would probably have been scared away. I’m glad I wasn’t. We drove along the narrow roads and I felt pride that this woman of a certain age not only conquered the challenge of Cape Flattery but the hour-long hike to Marymere Falls. To both my daughter and me, I thought…Oh ye of little faith.